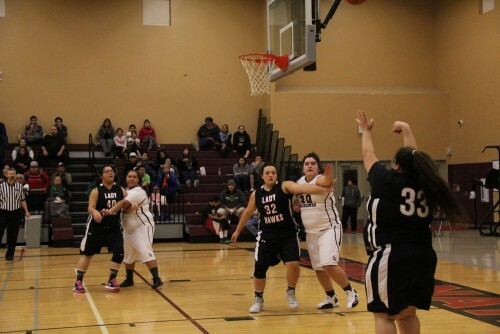 LUMMI – Tulalip Heritage Lady Hawks played a hard game against rival Lummi Nation Lady Blackhawks on Thursday, January 29, at Lummi High School. The Lady Hawks trailed at halftime 17-23, and could not take the lead to end the game 36-42. Lady Hawk Michelle Iukes led all scorers with 20 points. Lady Hawks play Skykomish Rockets next on February 2, at Skykomish High School. This entry was posted in Sports, Tulalip News and tagged Heritage Lady Hawks, Lady Hawks, prep girls basketball, Tulalip Heritage, Tulalip Heritage Lady Hawks by admin. Bookmark the permalink.